I love New Year's Eve. Even if it's a "one-second holiday", it's one of my favorite calendar events of the year. After all, each New Year is an opportunity for renewal and fresh optimism. Didn't like the last year? Make some resolutions and work to make the next year even better. Weird as it may seem, this post falls in line with making 2009 better. Frankly, I have come to believe that people are expecting too much from Marquette this year. Yet if you look at the projected Pomeroy schedule predictions, we presently see a projection of Marquette finishing 9-9 in conference. The numbers are telling us something different than expectations. Going 9-9 in conference may be a shocking scenario to some, even inspiring an interesting thread on MarquetteHoops.com. I wanted to take my own look at things because of a few concerns with the way that Pomeroy does his predictions. First, I don't think that his numbers take into consideration such factors as home versus road. It's no surprise that teams play better at home, but the statistics back it up. For example, Marquette averaged 1.06 points per possession of offense last year at home and on the road. However, the defense at home (0.91 ppp allowed) was much better than on the road (1.07 ppp allowed). In fact, only three teams in the Big East last year had winning road efficiency margins (UL, UConn, and Georgetown), and their statistics were still worse on the road. In addition, I'm pretty sure that Pomeroy also doesn't account for matchup-specific situations. In other words, what if two winning teams match up, but one is good at forcing turnovers and one is lousy at protecting the ball? What if a team is great at getting to the Free Throw line, but it doesn't matter for the other team's defensive efficiency? Therefore, I ran a model that looked at these two issues in particular with the following results. Road wins (high confidence) - NONE. It's the Big East, dummy! Seems about right. Probably the only quibbles I have right now are the likely win against UConn and how low the percentages are for ND, @GU, @UL, and @Pitt. With more data, those percentages should get better, but does anyone really expect us to win those games, except maybe in South Bend? However, the second area where Pomeroy's prediction is missing is a confidence interval. In other words, a prediction of 9-9 is useless without some sort of range. Therefore, I ran a monte carlo simulation with the predictions that are above. Hoping that the team ends up with thirteen wins and a shot at the Big East Championship? 2.8% chances are the odds. Or, if you really want to get freaked out... there's a one in four chance the team finishes with seven wins or less. Better said, as the team is playing now, the most likely scenario is that Marquette finishes 9-9 in conference, with a final record of 20-11 and hoping they get an NIT berth. Or worse. 22-24 regular season wins (we were 22-8 in regular season last year), finish somewhere between 2nd and 5th (11-13 wins) in the BIG EAST, and win their first game in the NCAA tournament. However, once I began looking at the numbers and prediction model with last year's data, my expectations were reduced to a record of 22-9 (11-7). This was still far less than the MUSCoop community. Why is Marquette on a trajectory towards a worse finish this year, despite all that experience? I don't have the answer to that question. Our defense is clearly worse, but it's unclear if it's coaching, the transition of systems, the lack of height, or any combination. 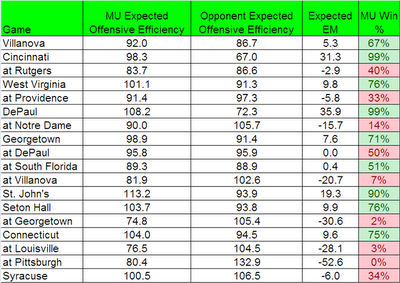 It's also clear that Marquette (#47 Pomeroy ranking) has not kept pace with the rest of the Big East. There are five teams in Pomeroy's top 10 ranking, and seven teams in his top 30. 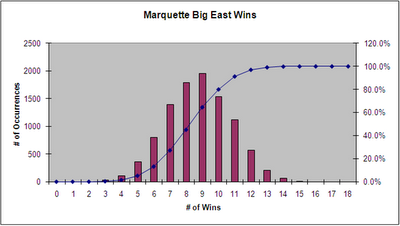 The rest of the Big East has gotten better, while Marquette is playing worse. It should be no surprise, then, that the predictions are for MU to finish worse. Sure, maybe there's a chance that the team will start playing better. The team is adjusting to the new system, and we'll get 13 min per game from Otule and Fulce (combined). I haven't given up hope on the 20%, but for now, my New Year's Resolution is to expect less. This is a phenomenal site and you guys do an unbelievable job covering Marquette hoops. 2 things stand out in my mind this year why Marq won't be as good. The team has ZERO inside presence. Baro was at least someone that had to be guarded even if he wasn't a huge threat. The 2nd is McNeil. He clearly believes he has to single-handedly lead the team offensively instead of playing within himself and letting his defense lead to offensive opportunities. He has been a bit of a disappointment(granted given huge expectations) especially after last year. Hopefully, he stays within himself during the Big East but it doesn't look like that will happen. Did you see him jawing at Buzz in a timeout during the Dayton loss?? No way that happens under Crean. This team will live and die by the 3 so there will be a few terrible losses and a few good wins. Just my 2 cents. Go Warriors ! I think there are several things to keep in mind. 1) The defense is worse because of the new system. I think it is a conscious decision this year to score more and quicker in the shot clock at the expense of some defense. Hopefully they will get better at this type of game as the season progresses. 2) This team should win many of their 'nail biter' games due to the experience of their main players. This will prevent the 7-win scenario. Keep in mind that experience is not just year in school, but also minutes played and time as the key players on the team. 3) I think Otule will be a significant help against certain teams. Against a big team, his ten minutes and five fouls will prevent scenarios like what happened against Dayton. Finally, Marquette is flawed, but has quality players. At the college level, that is enough to have a quality season. I would really be surprised with the NIT. Great post, Rob. One other factor to consider here (outside of defense, coaching transition, lack of height) is depth. Its clear that losing guys like Taylor, Williams and Mbakwe has forced Buzz to rely on players of lesser ability and those guys have not been able to provide breakthrough minutes (Cubillan & Acker in particular). Now maybe Otule and Fulce can help, and I think they will - - just not sure they're the influx of skill MU needs most. Interesting look at the tempo-free stats. Tomorrow's game should be a fun one for fans to watch! It is interesting. Before Fulce and Otule got hurt there were many high compliments on both. Now have have comments like "Now maybe Otule and Fulce can help, and I think they will - - just not sure they're the influx of skill MU needs most." Wow, is that a 180 degree change. I wouldn't be a bit surprised to see us finish 6-12, followed up next year with a team of freshmen sure to have their hands full. It might be time to start moving the women and children to the life boats. Happy New Year! Your sunny outlook always brightens my day and your courage to cheer for this team is inspiring! I am pretty sure that the Pomeroy Rankings do give an adjustment for how teams play at home and on the road when predicting games. Marquette has a long road ahead of it in the Big East. Though 9-9 in the league, if Wisconsin plays well in the Big Ten and the Golden Eagles get a few good conference wins, might be enough for an NCAA At-Large Berth. Linked to your blog for the Marquette-Nova game at LetsGoNova.com. Good luck, and wish us luck. We will need it vs. McNeal and James. I wonder what transfer has affected the team more negatively over the last few years more: Odartay or Mbakwe. Mbakwe stays and one of the two guys stays healthy, we at least have abled bodies. But...God, I just can't see how a team with three 1,000 point scorers and Lazar starting can't get us to 9-9. Happy New Year Cracked Sidewalks staff! Hoping New Years Day is a good one. I agree Gene. We never put our bench in completely, but mix one of them in with the Fab Four. If one of the Fab Four is having a sub-par night it seems to provide incentive provide motivation. The Mbakwe transfer hurts probably more in terms of the way it was done. Trevor was treated like gold. He lacks any class. Oliver, I certain Richard is just posting negative comments for fun, attention. Better to just ignore.